Project Perfect and Friends - Фондация "Деца с проблеми в развитието"
The project’s objective is to create a retreat centre for relaxation and recovery of children with disabilities and their families, as well as for athletes, adults with special needs or those who have suffered trauma. Perfect and Friends Project aims to provide a secure place for relaxation, where families can spend some quality time together, absolutely free of charge. Thanks to the great long-term partnership, the project’s realization has begun in the Perfect Holiday Resort, located in the Yamna village. Based on our pilot study THE FAMILY AND THE SECOND CHILD, as well as the opinions of the leading specialists in the field of neurorehabilitation and rehabilitation, we have developed an innovative support program to ensure the inclusion of people with disabilities in outdoor and social activities. Such programs are of paramount importance especially for children with special needs, because they allow them to acquire independence and sensory experience in a natural environment. This also helps them to achieve mental balance. The holiday resort Perfect is a small family hotel located in the very heart of the Balkan Mountains in the pretty village of Yamna. The village is nestled in a quiet valley among the mountain tops, about 700 m. above sea level, between the towns of Etropole and Teteven, just 85 km from Sofia. Located on a southern slope with a panoramic mountain view, the hotel offers a quiet and cozy atmosphere and provides the perfect conditions for family holidays, seminars, workshops, receptions and team-building events. The place was selected in 1934 by Popular Bank – Pleven for the employees’ children’s camp. Ten ha of land were purchased, fenced in and landscaped, and a three-storey building with 570sq.m. of gross floor area was built. After 1944, the Bulgarian National Bank acquired the site and added a new four-storey building with 700sq.m. of gross floor area and continued using it as a children’s camp and recreational school. After the year 2000, the property was auctioned and acquired by its current owners, who are developing it further. After the acquisition, the new owners refurbished a large part of the building and started exploiting it as a hotel with a restaurant and a conference room, and later built an outdoor pool. The old part of the building remains without renovation and is currently unused. This provides a great opportunity for joint exploitation and partnership. According to the signed contract with the owners of Perfect hotel, Kids with Developmental Problems Foundation will renovate one floor of the building in compliance with the regulatory requirements governing its use by people with disabilities, and will operate it as a retreat center for the next 10 years. 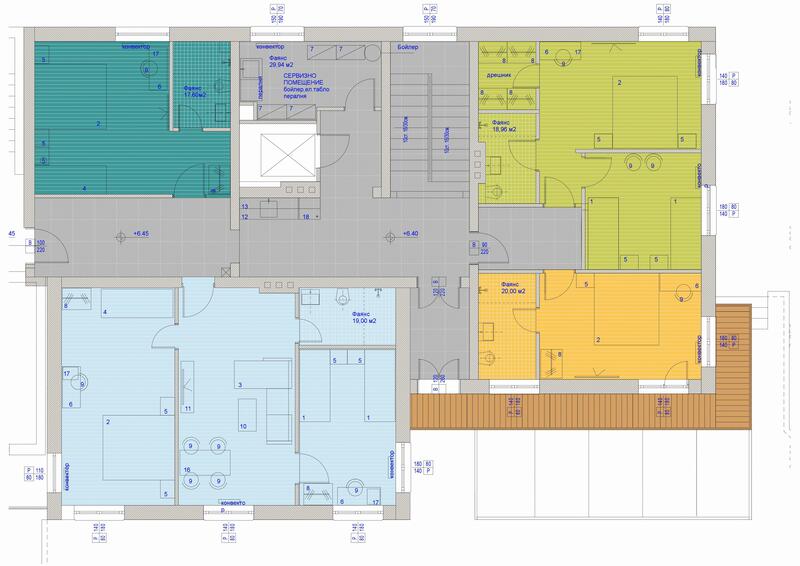 The site will consist of seven separate rooms with a total of 12 to 15 beds, fully compliant with the regulations for use by people with disabilities, common area, kitchen and specialized bathrooms. The total area of the retreat will be 190 square meters. The site will be accessible all year round, including the existing swimming pool, sports installations and rehabilitation room. The capacity is 200 families of disabled children annually. A Land Rover Defender 110 with 8 + 1 seats, adjusted for people with disabilities has also been provided, which would be suitable for the transportation to and from Etropole (12 km), for mountain hikes, picnics and excursions. Every contributor would be able to place their logo on this SUV, which we expect to be an integral part of our experiences at the resort. We kindly ask you to join us in this unique initiative! You can contribute by donating funds, materials or services. The realization of this project will serve as a model for other organizations in Bulgaria and abroad which aim to offer complex care that contemplates every need of disabled children and their families. © 2017 | Kids with Developmental Problems Foundation | All Rights Reserved.